I have been working hard to get leaner and trim my waist line. I have made some good improvements but I still have “love handles” I’d like to get rid of. Do you do any specific abs exercises or direct work for your obliques to give you a smaller waist line? 1.5 How Often Should Your Train Abs? 1.5.1.1 Is Spot Reduction Around the Abdominal Area Possible? 1.6 What Are The Best Supplements To Get Six Pack Abs? I don’t do any direct exercises for my obliques. I feel the oblique muscles get enough stimulation stabilizing your body as you perform compound free weight exercises like squats and overhead presses for example. 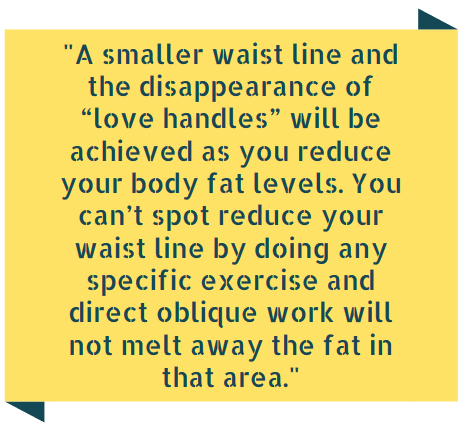 A smaller waist line and the disappearance of “love handles” will be achieved as you reduce your body fat levels. You can’t spot reduce your way to six pack abs by doing any specific exercise and direct oblique work will not melt away the fat in that area. You have to attack fat loss as an over-all body process. You must also work your legs, back, arms, shoulders, and chest for total fitness. Your waist line will become more trim as you lower your body fat around your abs. This will be a result of fat burning from watching your nutrition and your caloric intake closely with the addition of cardiovascular exercise to help you expend more energy. You need to create a calorie deficit and consume fewer calories than you expend in a day’s time. Rather than devoting the extra time and energy doing endless sets of oblique work, you’d be better off channeling that energy towards your nutritional plan and your cardiovascular out put. These are the two main components in the fat loss equation. How do you perform leg raises on the Swiss Ball to get a smaller waistline? Does this exercise help you lose love handles? To perform leg raises on the Swiss Ball you need to have something over your head that you can grab onto. I like to use the bar on the Smith Machine. That works well because you can easily adjust the height. I position myself so my body is resting approximately on the center of the Swiss Ball. You can move your body forward or backward on the Swiss Ball to make the exercise easier or more difficult. The higher the Swiss Ball is on your back, the harder the movement becomes. Once in position, I keep a slight bend in my knees and raise my legs approximately 12-14 inches past parallel then lower my legs until they are 2 to 3 inches below parallel. I am currently doing 2 sets of Swiss Ball Crunches and 2 sets of Swiss Ball Leg Raises for 10 to 12 reps each. I find these great for keeping my waistline slim. What should I be doing to harden or tighten my obliques? I’m thinking if I train my obliques it’ll help my abs show more. Your suggestions would be helpful! The obliques and the entire abdominal region get a lot of stimulation stabilizing your body during heavy compound exercises and I don’t think the obliques require direct work. Some people believe that training the obliques with exercises like side bends and twists will help to trim their waist lines. The truth is you can’t spot reduce fat from an area no matter what exercise or how many repetitions you do. Your abdominal development will become more visible as you reduce your body fat levels. That is a product of your diet and caloric expenditure more than any one particular abdominal exercise. I advise training your abs with the heavy weight. The abs are a muscle so train them with resistance in order to increase development. The abdominal region is worked indirectly every day during stabilization so I don’t think a lot of direct is required. I like to train abs once per week with a total of 4 or 5 weighted sets. *I perform Swiss Ball abdominal exercises to help improve my core strength and stability. Don’t try to get too creative with your abdominal training. Always remember the abs are a muscle like any other and should be trained heavy resistance to increase abdominal development. Your diet and cardiovascular efforts will reduce body fat levels and make the development you have achieved more visible. I want to add more cardio to help me get ripped with a smaller waistline but I am worried about losing muscle. Do you worry about losing muscle as you increase cardio? With an intelligent approach to training, nutrition, and supplementation, losing muscle with increased cardio is not a concern of mine and shouldn’t be a concern of yours either. First, make sure you continue to train heavy to effectively stimulate muscle growth. One of the mistakes people make when trying to get lean is they start training lighter thinking it will help them burn fat. Don’t make that mistake. Training lighter will only reduce the stimulus for growth, it will not help you get leaner. Next you want to make sure you implement an intelligent cardio strategy. Cardio is a tool to help you expend energy and increase your metabolic rate. This will be essential for getting in great condition. Just like anything else, some cardio approaches are more efficient and effective than others. To maximize the positive effects of cardio and minimize any potential negative impact on muscle building I suggest doing shorter (15-20 minutes), more intense cardio sessions. The key is to keep them intense and try to better your output each session. This shorter, more intense approach to cardio will cause a greater increase in your metabolic rate and elevate it for a longer period of time after exercise. Cardio timing is important so you don’t impede the muscle building process. You should spread your cardiovascular sessions at least 6 hours apart from your weight workouts if possible. To maximize your cardio and dumbbell training efforts you need to follow a sound nutritional and supplementation plan. Determine your daily caloric intake and nutrient ratios. This will ensure your body is getting all the fuels it needs to build muscle while not consuming an overabundance of calories which will promote fat gain. With all these factors in place, the only thing you are going to lose is the unwanted fat. Abdominal muscles are the part of the body that most people associate with a great physique. Many men strive to get a six pack and ripped abs, but so few actually get them. That’s perhaps why they’re they “gold standard”. We’ve all seen those infomercials that show the guy with a chiseled set of ripped abs or the pretty gal with a flat stomach performing abdominal crunches on those ab workout devices. The marketers of these devices claim they make abdominal workouts more effective than the traditional floor ab exercises. Is there any scientific evidence that supports the marketer’s claims? The simple answer to that question is “no”. However, a recent study examined the Range Of Motion (ROM) obtained using an ab-roller, and revealed these devices might be less effective than the standard abdominal crunch exercise that you can do for free! Using the latest research in biomechanical analysis techniques, this study showed that crunches performed with the abdominal devices resulted in less ROM in all angles measured when compared with a traditional crunch. ROM is a key aspect of muscle fiber recruitment, and these results indicate that ab-roller/rocker devices may, in fact, be less effective, not more effective, than the standard floor crunch, for working the abdominal muscles. How Often Should Your Train Abs? I do recommend training abs twice a week but each ab training session is designed to accomplish a different function. My first ab training session is on Mondays with the Swiss Ball. I do Swiss Ball ab exercises with body weight resistance to increase my core strength and stability. Core strength (the combined strength of all the muscles from your hips to your arm pits) is important as this is where you generate much of your power for compound strength movements. Improved core strength also guards against injury. My second ab session is on Thursdays with resistance exercises. I do resistance exercises to overload the abdominal muscles and increase my ab development. I think it is important for men to incorporate both kinds of abdominal work into your routine to achieve well developed abs and greater power through improved core strength. Is Spot Reduction Around the Abdominal Area Possible? First of all, spot reduction is impossible so regardless of how many crunches, sit-ups or bicycle kicks you do, you won’t remove any excess fat around your mid section. If you need to lose excess belly fat, your best bet is to go on a healthy diet and have the right combination of strength and cardiovascular training to maximize fat reduction while boosting your metabolism. If you currently have a relatively flat stomach and are trying to build your abs, there are some facts you should be aware of. The abs are similar to every other muscle in the body and must be trained as such. Like every other muscle, men should not train abdominal’s every day and should wait at least 48 hours in between ab workouts. Also, for a muscle to hypertrophy, significant resistance exercise is needed with a rep range of about 8-15 so if you’re able to do many crunches, you’re better off either finding a new exercise or to find ways to add resistance. What Are The Best Supplements To Get Six Pack Abs? I just started using the ab workouts in your style and I never thought I would say this about working out, but I am totally enjoying the muscle building process! My strength is going through the roof and my muscles look better than ever. I wanted to ask if you could you help out with some suggestions on a supplementation program for someone starting out? I’m a hard-working young guy with a decent career. I have the resources and the desire for a “top-of-the-line” starting program–as long as it works! Good for you! I’m glad you’re enjoying the programs and getting great results. Here is a program that will get you off to a great start. After you become consistent with these suggestions, you can build upon them later. How can you ever go wrong getting the very best source of protein available on the market? I have one scoop of Whey or Micellar Casein with each of my “regular” food meals every day. This is probably the one supplement most responsible for the 10 pounds of dense muscle I gained this past year. Because I heard all the research of how beneficial glutamine was to building muscle AND in promoting great general health, I use micronized glutamine daily. If you want to insure great general health and create an amazing physique at the same, I recommend you take a couple of multi-vitamins on a daily basis. I make sure I do every single day! Make sure you invest your hard-earned money in a powerful multi-vitamin. Getting your vitamins a couple of times a day is definitely one those supplements often overlooked that could possibly make a big difference toward achieving your physique-enhancing goals. This is one of the best muscle building and strength supplements of all time, and for good reason- it works. It can help you squeeze out an extra rep or two on each set- and lift a bit more weight. This is the key to getting bigger and stronger. Find a creatine that has the Creapure logo on it, as this will ensure high quality. There are tons of ways to take it. Experiment to see what works for you. Right now I’m taking 5 grams pre-workout with some whey protein and 5 grams immediately after with some whey protein. It’s working great. Do you think that mixing Gatorade powder with water might be better to drink during workouts rather than just plain water? Drinking Gatorade and other sports drinks to supplement your ab workouts and muscle building, weight training sessions do have some benefits. They can provide your body fast-acting, simple carbohydrates that help fuel your workouts. Sports drinks can also keep your body in a good mineral and water balance which can be compromised if you let dehydration occur. Sports or “energy” drinks, however, can contain a considerable amount of calories. If losing body fat or staying lean are a couple of your major fitness goals, those extra calories need to be accounted for in your daily nutrition plan. Remember, when trying to lose body fat, the bottom line is that you need to consume fewer calories than your burn each day. You may wish to consume those extra calories during your meals throughout the day. One way to eliminate the need for sports drinks while training is to keep your body properly fed throughout the day. If you eat a meal at least a couple of hours before your workout and eat another one soon afterwards, you should have enough energy to produce an intense and efficient training session. Your body should already be within an acceptable mineral and water ratio before you train and also replenish many of the minerals lost while working out. While I don’t necessarily feel there is a tremendous need for sports drinks while you are training, I do encourage you to drink plenty of water. Try to drink some water at least every ten minutes while you work out. Never let yourself feel thirsty. Keep in mind that if you ever feel thirsty, your body has already been in need of more water for a considerable amount of time. I just added GABA to my list of muscle building supplements. Should I take it on my days off? It may be a day off but that doesn’t mean you don’t need to worry about nutrition. In fact, it is quite the opposite. Your off training days are a necessary part of the muscle building equation and in order to take full advantage of this important time and maximize recovery you need to focus on nutrition and supplementation just as you would any other day of the week. I would highly recommend taking GABA on your days off as well. A 5 gram dose of GABA shows a significant elevation in growth hormone levels and taking GABA before bed promotes a more restful sleep. The combination of increased growth hormone levels and a more restful sleep will greatly enhance your body’s recovery ability. Get the most out of your days off by following a consistent nutritional plan capped off with a dose of GABA. Using this program will amplify the results of your ab workouts. By Body-For-Life Champion, Charles Damiano.